I feel like I've been saying this in every post lately but.... I'm so sorry I have been so MIA! I mean you may not have even noticed but I feel like my blog and everything that goes along with it has been totally put on the back burner for the past month or so. With my work hours I just seem to have had no spare time to knuckle down and get my blog-on which has made me feel very stressed, to say the least, but sometimes I need to remember it's not the end of the world and maybe sleep and chill out time is a prioriety aswell. So.... onwards and upwards - I can't wait to get back on track and continue with my number one passion as much as I can! With fashion season well and truly on it's way and new designs and trends popping up left, right and center it would only be polite for Diet Coke to join in. With previous fashion collaborations including names like Jean Paul Gaultier, Matthew Williamson and Marc Jacobs, it is always a huge opportunity to be able to put your own stamp on that famous bottle. This season it is the turn of the founding designer of J.W. Anderson - Jonathon Anderson. These bottles are always such a huge hit and being limited edition they sell out fast. My mum STILL has the gorgeous JPG bottles up in her downstairs shower room and they look SO cute! This time round the design has been inspired by the brand's signature knitwear prints, the bottles are covered in an imaginary Italian postcard scene with two different designs to choose from. Diet Coke were nice enough to send me a bottle of each design and a cute cotton tote bag alongside them which are featured in the photo above! 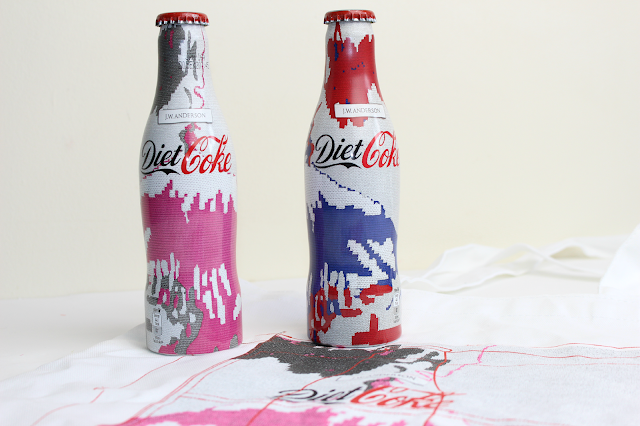 The full collection features the two limited-edition diet coke bottles (available singularly and in a multi-pack), t-shirts, the tote bag and a premium notebook. Each bottle is priced at £1.95 and the Collector's Box Set is £29.95 - all of these can be found at Harvey Nichols online - here. How cute! If only all coke bottles looked like this all the time! Love these designs <3 ! Gorgeous! Diet Coke has been my one true love now for many years - I panic when I run out! These are lovely designs, I will definitely pick these up. Thank you for showing them! Instead of eating a heavy meal, distribute your meal in several smaller meals. It helps your body absorb all the nutrients and will also keep up your metabolism.